Ewan French is currently in his second and final year with boomsatsuma, although his journey with us starts a number of years earlier. As a student at Bristol Brunel Academy, Ewan sent a very kind letter to the team at boomsatsuma and also approached the team at the Raising Aspirations event at UWE in 2014 to request that he spends some time with us through the year for his work experience. His passion for getting involved in as many projects as possible and eagerness to gain valuable experience captivated us very early on. He spent a week with us for work experience in year 10, but that was just the beginning. Ewan quickly developed the opinion that the supportive and opportune environment we provide at boomsatsuma was one in which he could thrive creatively. He visited us and took part in a number of projects regularly over the following years and applied to study on our (then brand new) Media Production Diploma at Engine Shed at the end of year 11. Ewan’s creative interests sprawl across the various industries, but he has always favoured film. I met with Ewan to talk about his newest short film Legacy, and he started by reminiscing about his first short action film, which he made aged 11 with ‘lots of nerf guns’. He borrowed half broken cameras from neighbours, where all his filming was plagued with a low-quality 480p image and static noise over all of the footage, however, this never bothered him. The act of making these short films fairly quickly transitioned from the assumed antidote of boredom to a passion and an ever-improving set of skills. After the passing of his grandfather in November 2016, Ewan made the prequel to LEGACY. Working with family, friends, boomsatsuma, St. Mary Redcliffe Church and many others, BELIEF tells the story of how the passing of a loved one affected him and how he learned to handle the myriad of emotions that came with it. Ewan bagged the 'Best Short Film' award at the Pocket Pictures Film Competition at Curzon Cinema & Arts in Clevedon last year for BELIEF. If you haven’t already, be sure to watch BELIEF below! Fast forward to October 2017 and Ewan is embarking on the production of the sequel to the first film. Whereas BELIEF aimed to tell the story, the intention of LEGACY was closure for Ewan. But not just himself; in fact, he notes a number of his family members found BELIEF too difficult to watch at first and that LEGACY provided the more celebratory themes that many of the people around him desperately needed when moving on. Interestingly, Ewan mentions that he feels that if around his grandad would have in fact said not to make the films unless it was useful to Ewan and those around him. The key theme is vulnerability. Ewan strongly believes that opening yourself up to vulnerability when it comes to your emotions is a powerful tool for unloading and empathising. ‘Vulnerability on show’, Ewan notes, is something Amy Winehouse was fantastic at in her lyrics and that he sees a source of inspiration in that approach she took with her work. Many of those that followed Ewan’s journey in relation to his grandad may be surprised to understand that LEGACY was in fact the original idea, before the plan for the first film, BELIEF, came about. Much of the archival footage used in the film, which Ewan was grateful for family helping him source and digitise, was in fact on a smaller film on his YouTube channel simply entitled ‘Gordon French’ but only shared with a tiny number of people. It currently sits at 16 views. This very private film was the starting block for sequel. Working with Joey, his younger brother for the first time on a short film and allowing himself to create the two films in very different styles led to the creation of LEGACY. One of the only a few common ties between the films is the use of a darker shade of red; notice the use of red in a number of scenes in BELIEF and for the sea in LEGACY at the same emotional stand points in both films; symbolising the pain felt by those affected. This differentiation and incomparability of the two films was no accident however; ‘it felt different throughout production’ and ‘people wouldn’t need to pick their favourite’, Ewan says. You can watch LEGACY in full below (headphones recommended). Ewan concludes with his admirable ambitions for the future. 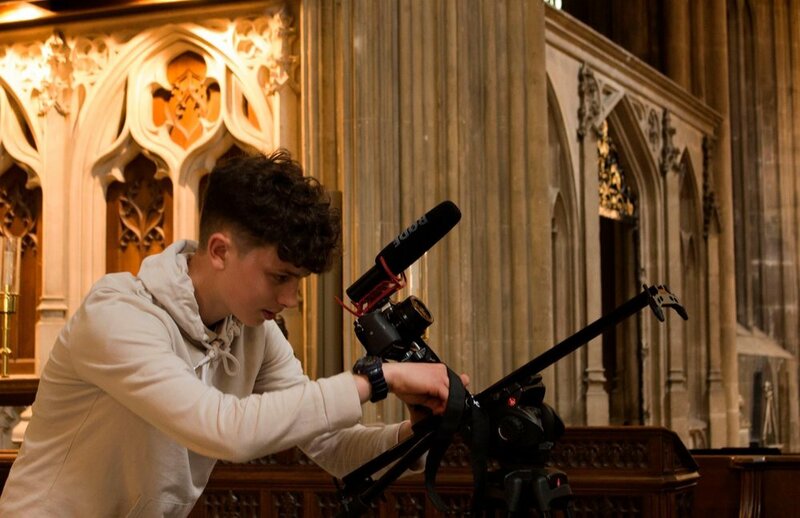 As he did with his Media Production Diploma at boomsatsuma, Ewan has intentionally sought out a newer, alternative provision for his higher education; Screenology in Bristol, where he’ll continue to broaden his filmmaking skills specifically, increase his platform and focus his pathway. ‘Hollywood has been done’, Ewan proclaims, ‘I’m really keen to head towards helping less advantaged people with my projects’. He wants his work to ‘go deeper than just a final product’, to provide ‘empowerment’ for local communities, encouraging ‘art from everyone, everywhere’. We even spoke of coining a term for it... #Bristolwood, anyone? These humanistic and skilful endeavours for the future are very enlightening and something we at boomsatsuma are so proud of in our students. ‘A neat way of looking at it’, Ewan adds is to remember an analogy from one of boomsatsuma’s first full-time students, Abdirahman Adam; ‘if you want to become a pilot and learn to fly, someone has to lend you a place and let you fly’. He says he hopes to take it one step further still by aiming to help build the planes that those young people can fly. We expect to see lots more wonderful work from Ewan and film label Basset & Braggs both in the short term and the coming years, so be sure to sign up to the boomsatsuma newsletter and subscribe to Ewan on YouTube so you don’t miss a thing.